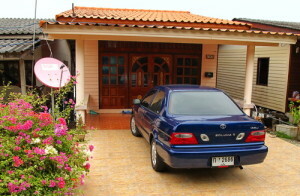 Overall there is quite a large Chinese community in Thailand. Besides often being successful businessmen, their communities add to Thailand’s exotic flavor with their artistic decorations, colorful lanterns, acrobatic dragon and lion dances, sometimes bizarre festivals and temples with gigantic incense sticks burning in front of them. 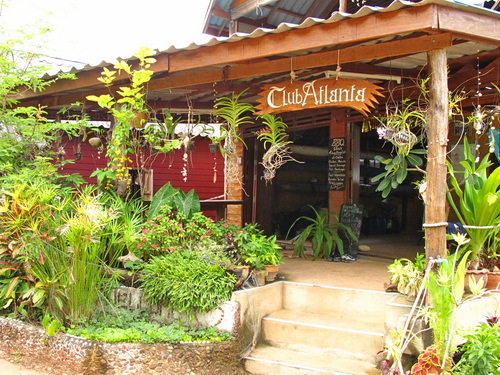 Lanta Old Town’s claim to fame is that it carefully preserves its historic character, making it by far the most interesting town on the island. 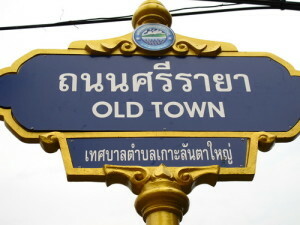 “Town” is really an exaggeration. The actual historic section is really only one street along the water front, but this one packs a lot of attractions which can all be conveniently navigated within a few minutes of walking. 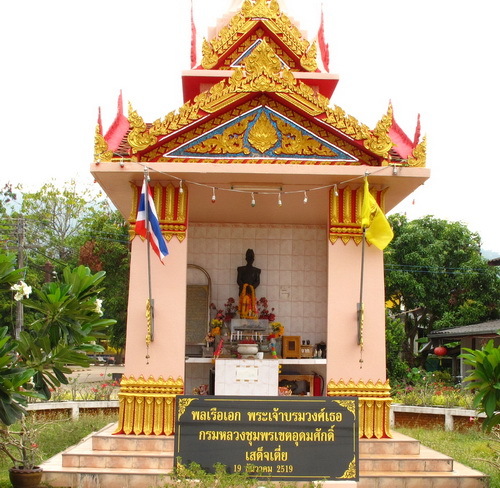 The main section starts at the official entrance gate and ends at the statue of the patron saint of the town. The story goes that the statue represents the benefactor and protector of the area – an actual historical person, not a deity. Once the yearly Chinese festival was threatened by a huge rainstorm. The locals prayed at his shrine to stop the rain, and miraculously the clouds cleared up and the festival could proceed. After this event the Chinese community built the current shrine to commemorate this miracle. They are still praying there to get their wishes fulfilled. All the houses on the ocean side of the street look like narrow wooden shop houses. However if you look closer, you find that they extend out into the ocean for quite a distance. 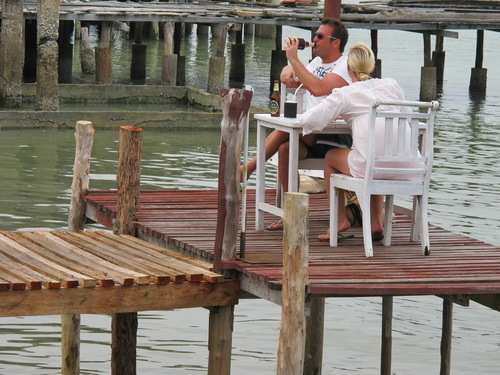 They are built on stilts and have large patios over the water. The original purpose was probably twofold. 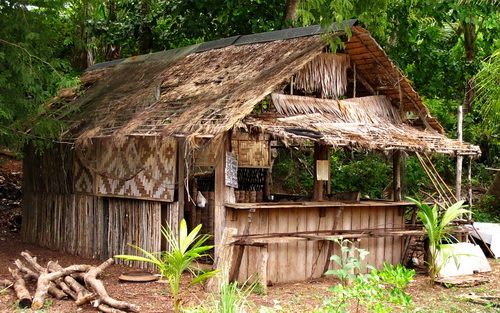 In this hot tropical area the patios are a delightful place to enjoy the fresh ocean breeze, and they were also very convenient for the main business of the town – fishing. 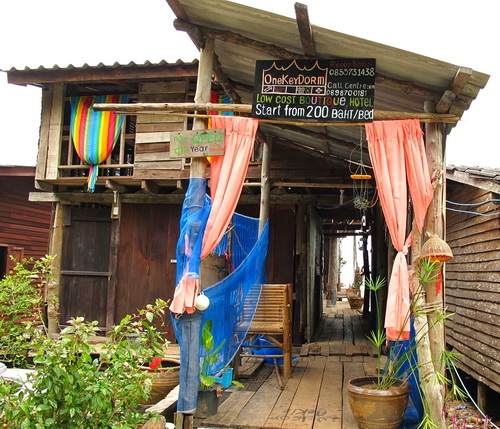 Fishing is still an active industry there, but Lanta Old Town’s main income has been replaced by tourist revenue during the high season from October through March. Pretty much every single building on main street has been converted into a restaurant, guest house, or souvenir shop, and business owners are doing quite well. The traditional way of life has not disappeared though, since during the low season from May through September there is hardly any tourist in sight, and the locals pursue fishing and agriculture. 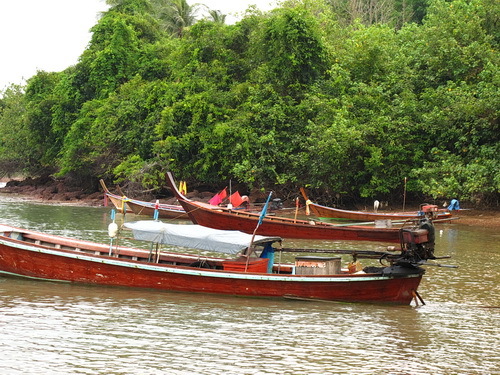 The summer monsoon season brings lots of wind and rain, and the boats which ferry tourists to several surrounding island during high season sit idle or are re-purposed for fishing. There is also a gradual influx of outsiders and even foreigners who buy some of the old buildings and restore them or start businesses as well. However Lanta Old Town is only suited for people who don’t mind living off the beaten track, enjoy a really slow pace of life, and don’t expect everything to work efficiently and quickly. You need time and patience in this town. 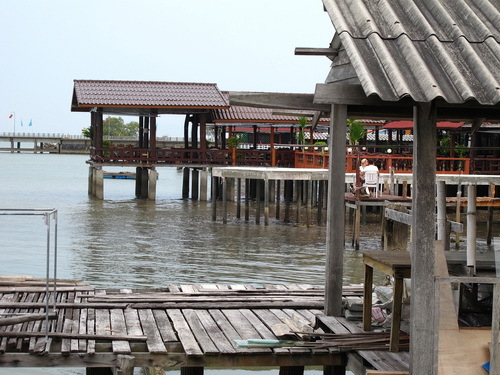 Lanta Old Town restaurant on stilts. Dining in Old Town can be quite a romantic experience. 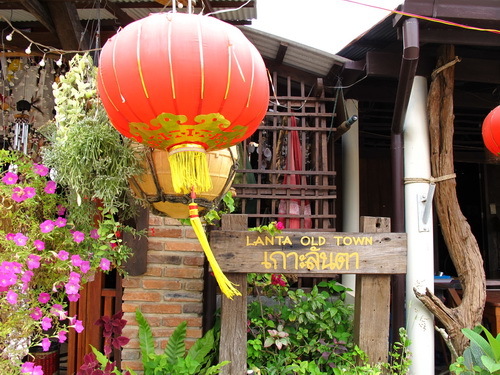 Visiting Lanta Old Town is like a walk in the pages of history without the inconveniences of previous centuries. You can sit on the back patio of an excellent restaurant right over the water, eat pizza or sip mango shake, while watching a gorgeous ocean scenery with gentle waves lapping around you. It is definitely a unique experience in Thailand and highly recommended. 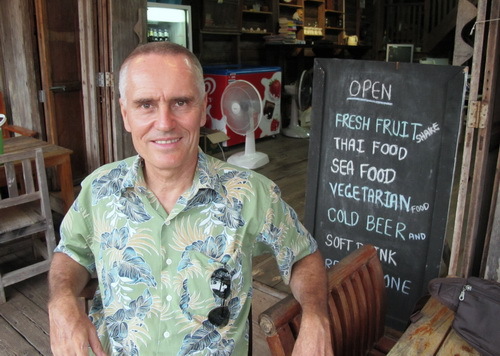 The author, Shama Kern, has been living in Thailand for over a decade and loves exploring this fascinating country. Thanks Ursula, the next article is in preparation already!